Addresses the entire body, opening energy pathways, stimulating the nervous system, increasing range of motion and creating functional strength through rhythmic, flowing movement sequences. Performed on custom-designed Gyrotonic equipment,the carefully crafted sequences create balance, agility, strength and flexibility. Inspired by the search for the ultimate number and the principles of the resonance of the body in space and of projection into digital space, SuperSuper is a triptych composed of Super8, Super réalité and Super N64. 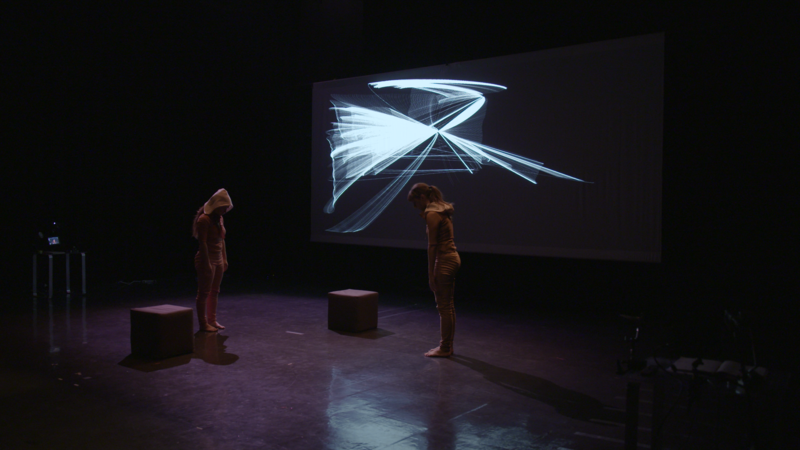 Two performers enact a dizzying gestural composition, redirecting digital code into poetry. Body, sound and image are modeled on and articulated through a tracking system, and the performers’ gestures and movements slowly build a parallel world, an augmented space, a kind of databank. The protagonists work under surveillance that keeps them prisoners of the game in which they are evolving and which eventually culminates in a rereading of Mallarmé’s “Un coup de dés jamais n’abolira le hasard.” SuperSuper synthesizes all of Line Nault’s artistic preoccupations, built as it is around systems, coding, generative flow, movement and words – i.e., movement that speaks and words that move – catapulting physical, sound and visual elements into areas where perception is completely transfigured. SuperSuper a été rendu possible grâce au soutien financier du Conseil des Arts du Canada. Une co-production de Recto-Verso et du studio Artificiel. Remerciements: Julie Chaffarod, Jimmy Lakatos et Karine Denault et Ariane Plante. Toute l’équipe de Recto Verso et de l’Agora de la danse.